As El Cid, defender of the Christian faith, mercenary warlord Rodrigo Diaz de Vivar became the first Spanish national hero. Rodrigo was taken into the court of Prince Sancho, future king of Castile. There he spent his formative years training to be a knight. In addition to riding and swordsmanship, Rodrigo’s education included Latin, Arabic, the Bible, ancient history, and military treatises. When Sancho was crowned king of Castile after his father’s death in 1065 (Fernando I divided the kingdom between his three sons), Rodrigo was made commander, or armiger, of Sancho’s military forces. As armiger, Rodrigo was charged with recruiting, training, and commanding Sancho’s household troops, the king’s most elite and deadly knights. In this role, Rodrigo eventually became known as campeador, or military leader. In 1068, Sancho began a war against his brother Alfonso of Leon. Rodrigo led the king’s household troops at the Battle of Llantada, on July 19, 1068, and again at the Battle of Golpejera, on January 10, 1072, which resulted in the defeat and exile of Alfonso. Rodrigo’s final service to Sancho came later that year at the siege of Zamora, which Alfonso had seized in a bid to regain his kingdom. The siege lasted until October 7, 1072, when Sancho was assassinated. Upon the king’s death, his army fled. With Sancho’s death, his brother, now styling himself King Alfonso VI, ruled a kingdom that combined Galicia and Castile, with his seat at Leon. Alfonso retained the service of Rodrigo, which speaks highly for Rodrigo’s military credentials. Two years later, Alfonso married Rodrigo to his beautiful niece, Jimena Diaz. Despite marrying into royalty, Rodrigo was demoted from armiger. Instead, he tended to various legal and religious affairs throughout the kingdom. He also fought in the 1076 campaign against Navarre, a victory that led to the annexation of several provinces to Castile. The most important duty Rodrigo performed for the king was the collection of tributes. In 1079, he was one of several noblemen dispatched to collect tributes from the state of Seville. While there, Rodrigo became embroiled in a war between Seville and its eastern neighbor, Granada. In the operations that followed, he commanded a detachment of Christian troops in Seville’s army. The campaign culminated near the frontier castle of Cabra, where Seville’s army defeated the Granadans in a three-hour battle. Rodrigo captured several prominent Granadan soldiers, including Count Garcia Ordonez. It was here that the trouble began for Rodrigo. Ordonez was a powerful Castilian count married to the sister of King Sancho IV of Navarre. 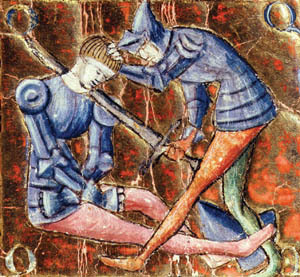 Ordonez’s capture and subsequent ransom by Rodrigo was a humiliation for the royals. To make matters worse, Rodrigo bragged openly of his triumph over Ordonez. After he returned to Castile, enemies began complaining to the king of Rodrigo’s various misdeeds. Two years after the Cabra campaign, a party of bandits from the state of Toledo raided Rodrigo’s lands on the River Duero. Enraged, he launched a retaliatory raid against Toledo. When King Alfonso learned of the raid, he was gravely displeased. Toledo’s emir, al-Qadir, was friendly to the king and had paid tributes to Castile. Rodrigo’s actions were a serious diplomatic provocation; Alfonso needed to take quick action to mollify Toledo. Seeing an opportunity to shame Rodrigo, Ordonez and his allies at court convinced the king to banish him from Castile. Rodrigo was forced to look for employment in another kingdom. He eventually found work with al-Muqtadir, emir of Zaragosa. Soon after Rodrigo’s arrival, the emir died and the kingdom was divided between two sons: al-Hayib, who got the western half based at Denia, and al-Mu’tamin, who retained Zaragosa and Rodrigo’s services. With a war for control of Zaragosa looming, Rodrigo was a powerful ally. Not only did his military reputation speak for itself, but Rodrigo also brought a body of Christian knights with him, a sizable contingent of well-trained veterans who were personally loyal to him. Al-Hayib had allies of his own—Sancho of Aragon and Berenguer of Barcelona—which meant that he could threaten Zaragosa from the north as well as the east. Rodrigo was given command of Zaragosa’s armies and skillfully maneuvered to prevent an invasion. When al-Hayib and Sancho moved against the frontier castle of Monzon, Rodrigo marched his army there and reinforced the garrison before they could attack. He then marched south, where he fought and won a small skirmish. Afterward, he refortified and garrisoned the frontier castle of Almenar. With Almenar protecting his northern flank, Rodrigo returned south and attacked al-Hayib’s castle at Escarp. Rodrigo and his men slaughtered great numbers of the Almoravids (also known as Moors) and took the castle. While Rodrigo was taking Escarp, al-Hayib and Berenguer marched back into Zaragosa and besieged Almenar. Rodrigo sent to the king for reinforcements, who brought them to the town of Taramite, northwest of Almenar, and linked up with Rodrigo. At Rodrigo’s suggestion, al-Mu’tamin offered tribute in exchange for the enemies’ withdrawal, but they refused and offered battle. In the ensuing Battle of Almenar, Rodrigo triumphed. The greatest part of Berenguer’s forces was killed, and Berenguer was promptly captured and ransomed. Rodrigo was celebrated as a hero in Zaragosa, where al-Mu’tamin showered him with gifts of gold and silver. Rodrigo’s next great campaign came in 1084, when al-Mu’tamin directed him to attack Aragon. From the fortress of Mazon, he launched a raid into King Sancho’s territory and for five days ravaged Aragon and stripped it of its riches. After this, Rodrigo invaded Denia, a raid that culminated in a bloody battle for the castle of Morella. Determined to stop him, Sancho and al-Hayib combined their armies and attacked Rodrigo as he marched along the Ebro River. On August 14, 1084, Rodrigo won a great triumph at the Battle of Ebro, capturing 2,000 men, including 16 nobles, and taking great chests of booty. While Rodrigo was in exile, Alfonso had been expanding. His most notable conquest was the city of Toledo, which he took in 1085. Alfonso’s aggressiveness forced the intervention of a new power, the Almoravids, who were recent Muslim converts from West Africa. Their fanatical zeal helped them establish a vast kingdom whose northern fringe reached the Mediterranean. Desperate for help against the encroachments of Castile, the other Muslim states appealed to their brethren for help. Led by fundamentalist fanatic Emir Yusuf ibn Tashfin, the Almoravids crossed into Spain and defeated Alfonso at the Battle of Sagrajas on October 23, 1086. Alfonso badly needed allies and fighting men. Rodrigo was an obvious choice. Thus, in 1087, Alfonso reconciled with Rodrigo. But, rather than fight the Almoravids, Rodrigo’s first task was to stabilize the situation in Valencia, which had revolted against Alfonso’s puppet ruler, al-Qadir. Trying to take advantage of the turmoil, Count Berenguer had invaded and lay siege. Rodrigo first demanded tribute from Albarracin, a city about 100 miles to Valencia’s northwest. With funds secured, he marched for Valencia. Upon Rodrigo’s approach, Berenguer lifted the siege and withdrew. Rodrigo remained in Valencia to ensure Alfonso’s rule and deter Berenguer. Meanwhile, in 1089, the Almoravids returned to Spain and besieged Aledo, a southern Castilian stronghold. In response, Alfonso raised an army, marched south, and ordered Rodrigo to link up with him. Because the king remained on the move, however, Rodrigo was unable to effect a quick junction. Lest he be accused of disloyalty, Rodrigo marched to several towns looking for the king but was unable to find him. Finally, as Alfonso’s army drew near, the Almoravids withdrew from Aledo. With the failed juncture as ammunition, Rodrigo’s enemies at court renewed their intrigues, accusing him of deliberately avoiding the union of the two armies in the hopes that the Almoravids would destroy him. Rodrigo desperately tried to prove his loyalty, swearing several oaths to the king and even going so far as to offer to prove his virtue in single combat against a champion chosen by the king. Alfonso was unimpressed. Rodrigo’s land was confiscated, his family was temporarily imprisoned, and he was exiled. This time Rodrigo did not seek employment with another kingdom. In his operations around Valencia he had seen how unstable the city’s government was. Al-Qadir was at odds with a pro-Almoravid faction, while outside Valencia several towns nominally under al-Qadir were in open revolt. Seeing an opportune target, Rodrigo resolved to take Valencia for himself. Again Rodrigo brought with him a sizable contingent of Christian knights. Beyond that, he had allies in Zaragosa, contacts he had made around Valencia, and most of all his reputation as a warrior, which enabled him to attract worthy men seeking adventure and glory. Rodrigo spent the winter of 1089-1090 at Elche. Needing to raise funds for the upcoming campaign, Rodrigo attacked his old enemy, al-Hayib. After taking the castle of Polop, he extracted tribute from the emir. He then marched against Valencia and received additional tributes not only from al-Qadir but from those rebelling against him. Meanwhile, al-Hayib turned to Berenguer for help. Berenguer absorbed al-Hayib’s army into his own and went looking for Rodrigo, passing through Zaragosa on his way. Zaragosa’s new emir, al-Musta’in, remembering Rodrigo’s loyal service to his father, sent a warning to him that Berenguer was coming. With a large force bearing down, Rodrigo retreated to Morella in the mountainous north. Now on secure territory near the wood of Tevar, Rodrigo tried to provoke Berenguer into battle. There followed an extraordinary exchange of letters between Berenguer and Rodrigo, in which each claimed to have been wronged by the other. Most notably, Rodrigo questioned Berenguer’s honor, his fighting skills, and even his manhood. But Berenguer would not be goaded into a headlong charge. Instead, on the eve of battle, he sent a detachment of men around Rodrigo’s flank. His men valiantly fought off Berenguer’s initial charge. Rodrigo counterattacked, and in the ensuing melee he was wounded and unhorsed. Despite the loss of their commander, Rodrigo’s men vanquished Berenguer, looting his camp and taking many prisoners, the count among them. Rodrigo spent several months at Zaragosa recovering from his wounds and negotiating a favorable truce with Berenguer, who, owing to the sudden death of al-Hayib, found himself without allies. Rodrigo resumed his operations around Valencia. While he was besieging the castle of Liria, however, word arrived from Queen Constance that Alfonso was once again marching against the Almoravids, who had taken Seville. This was a golden opportunity for Rodrigo to prove his loyalty to the king and assert his own power. Rodrigo joined Alfonso outside of Cordoba but gratuitously insulted Alfonso by encamping on level ground in front of the king’s pavilions, implying that he was the king’s equal. Rodrigo insisted that he had chosen his position by military necessity, but Alfonso was once more enraged and banished Rodrigo from his camp. From then on, Alfonso was his implacable enemy. De Vivar’s Sword ‘Tizona’ | The Madrid Army Museum. The crucible of events now shifted to Valencia, where Rodrigo, Alfonso, and Yusuf vied for the city. Rodrigo acted shrewdly, negotiating an alliance between his friends in Zaragosa and the king of Aragon. In 1092, Alfonso made his move and laid siege to Valencia. Instead of confronting Alfonso head-on, Rodrigo chose to draw him away from Valencia by invading Castile. Marching along the Ebro, Rodrigo laid waste to the land. The raid forced Alfonso to lift the siege and rush back to Castile, and the raid was also a personal blow against Rodrigo’s old rival, Ordonez, who had extensive holdings along the river. While Rodrigo was in Castile, the Almoravids returned to Spain and took Aledo. In conjunction with Yusuf’s advance, the pro-Almoravid faction in Valencia staged a coup and installed its own ruler on the throne. With Alfonso occupied by Yusuf and the Almoravids, Rodrigo began a campaign of slow strangulation against Valencia. He first took the castle of Cebolla, to the north, which he made his base of operations. After plundering the countryside, he took Valencia’s northern and southern suburbs. After his victory, Rodrigo moved south to the town of Villena. In doing so, he drew supplies from previously unravaged territory and positioned himself to block an Almoravid move to relieve Valencia. Rodrigo pressed his siege and, on June 15, 1094, took Valencia by frontal assault, after which his men brutally sacked the town. After hearing of the ravages inflicted upon Valencia, Yusuf dispatched a large army to liberate it. As the Almoravids marched up the coast and encamped south of the city on the plain of Cuarte, Rodrigo remained inside Valencia. After a 10-day siege, Rodrigo decided on bold action. He led his forces out of the city and divided his troops in two. One wing attacked the Almoravid army, while the other rode around their flank and assaulted the camp. The Battle of Cuarte resulted in an Almoravid rout that yielded vast amounts of treasure and supplies. Most importantly, the battle was the first defeat inflicted upon the Almoravids by Christian warriors. Rodrigo went on the military and diplomatic offensive, taking the castle of Olocau to the north and confirming his alliance with Aragon’s new king, Pedro II. In conjunction with Pedro, Rodrigo fortified and garrisoned his castles on the southern frontier. While doing so, he encountered another large Almoravid army. Not wanting to fight, Rodrigo swung east in an effort to get to the coast and marched north to Bairen, but found that the Almoravids had outraced him and positioned themselves on high ground, blocking his retreat. Trapped, Rodrigo and Pedro unleashed a frontal assault on the Almoravids that swept them from the high ground and pushed them into the sea. After this battle, Rodrigo’s last great military operation was against Murviedro, a massive coastal fortress that had aided an incursion into Valencia by the Muslim governor of nearby Jativa. Murviedro appealed to the various Spanish kings for support, but the rulers refused direct battle with Rodrigo, who had bested too many enemies in the past. Abandoned and besieged, Murviedro surrendered on June 24, 1098. The following year, Rodrigo rushed back to Valencia to defend it against a renewed Almoravid attack, but he died unexpectedly on July 10, 1099. With no successor to Rodrigo (his only son, Diego, had been killed at the Battle of Cuarte), Valencia fell into Almoravid hands in 1102. During the next century, the historical Rodrigo was slowly transformed in poems and ballads into El Cid, a noble and unselfish knight who had battled Muslim infidels in the name of King Alfonso and the Christian faith. (Ironically, Cid was a corruption of the Muslim word for lord, sidi.) Rodrigo Diaz de Vivar was many things, but he was not El Cid. He was a good knight and an able field commander, winning no less than seven battlefield victories. But he was also a mercenary warlord, fighting not for a king or a faith—but for himself. With the Reconquista, or reconquering of Spain by Christian fighters, Rodrigo the man became El Cid the legend, the first Spanish national hero. Tags al-Hayib, al-muqtadir, al-qadir, Alfonso of Leon, Almoravids, Battle of Cuarte, Battle of Ebro, Battle of Golpejera, Cabra Campaign, Count Garcia Ordonez, El Cid, Fernando I, Jimena Diaz, King Alfonso Vi, Mediterranean, Muslim, Prince Sancho, Rodrigo Diaz de Vivar, Sancho of Aragon, Siege of Valencia, Siege of Zamora, Spain.